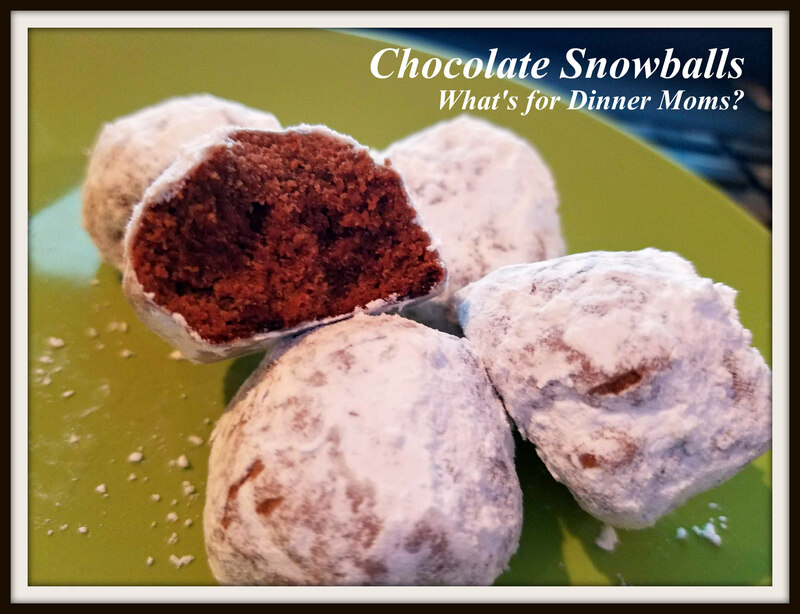 Week 3: Chocolate Snow Balls – What's for Dinner Moms? Life has been absolutely crazy lately but there is always time for Christmas cookies! I finally finished my tax class, my son’s musical is over, the event I have been planning for months is tonight, and soon I will be able to breathe. But, until then I will find time to bake some cookies once in awhile to make my weekly commitment to Christmas cookies. If you are going to freeze these cookies I recommend rolling them once in powdered sugar and then freezing them. When you remove them from the freezer once they thaw roll them in powdered sugar again to freshen them up. I have to make more of these because my family ate them all! I guess they really liked them. Tip: DO NOT OVER BAKE! These cookies will look a bit underdone but if you over cook them they will get hard and crumbly. You want them a bit soft. Similar to Walnut Snowballs except made with chocolate! Preheat oven to 375°. Line a cookie sheet with parchment paper. Mix butter, 1/2 cup powdered sugar, cocoa, and vanilla with an electric mixer until light and fluffy. Add flour and mix until the dough comes together. Stir in the chocolate chips. If dough is too soft, chill it until you can work it easily with your hands. Bake cookies for 7-10 minutes until bottoms are just slightly brown and the tops are no longer glossy. Be careful not to over bake cookies! They will get hard if overcooked. Remove from oven and cool for 5-10 minutes, until you can handle them. Roll each cookie in the sugar until coated. Place cookies on a rack to cool. Roll in powdered sugar once completely cooled if desired. My kids loved making them with us. These look lovely, Marci. I will make these for Christmas. These look lovely Marci! Take care and relax for a few! Trying to find Week 4…. Hmmm. Seems not to have posted. Need to find it!